Personalized Certificate of Adoption, Fun Facts about Manta Rays, MCC Sticker, Specific details about your Manta Ray, Six-month update about your Manta Ray, Personalized 8x10 photo of your Manta Ray with business logo and name, Ideas and Facts to make your business eco-friendlier, Small Manta Ray stuffed animal, and Recognition on MCC Social Media. Exclusive Manta Ray adoption, personalized Certificate of ADOPTion, Fun Facts about Manta Rays, Ideas and Facts to make your business eco-friendlier, MCC Sticker, Specific details about your manta ray, Six-month update about your manta ray, Personalized 24 X 36 photo of your manta ray with business logo and name, Manta Ray stuffed animal, and Recognition of donation on website and social media. Exclusive Manta Ray adoption, Personalized Certificate of ADOPTion, Fun Facts about Manta Rays, Ideas and Facts to make your business eco-friendlier, MCC Sticker, Specific details about your Manta Ray, Six-month update about your Manta Ray, Personalized TWO 24 X36 photo of your Manta Ray with business logo and name, Manta Ray stuffed animal, Recognition of donation on website and social media, and private presentation at business or through internet access about Manta Rays. Includes acoustic receiver and tag for Manta Ray small-scale movement. Come and be a scientist for a day and help us deploy your donated acoustic receiver and tag. If you are unable to attend, we will video our research day. You will receive a Personalized Certificate of Adoption, Fun Facts about Manta Rays, MCC sticker, individual picture of your Manta Ray, and a detailed historical information about your Manta Ray. We will give you a personalized update of what we learn from your acoustic receiver and tag. Recognition of donation on website and social media. Includes satellite tag for Manta Ray large-scale movement. Come and be a scientist for a day and help us deploy your donated satellite Tag If you are unable to attend we will video our research day. You will receive a Personalized Certificate of Adoption, Fun Facts about Manta Rays, MCC sticker, individual picture of your Manta Ray, and a detailed historical information about your Manta Ray. We will give you a personalized update of what we learn from your satellite tag. Recognition of donation on website and social media. 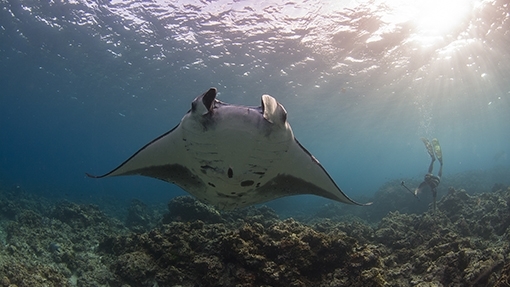 * Adopt A Manta and the Manta ID program are copyright of Micronesian Conservation coalition.